Teenage and young adult cancer patients experience a wide range of physical, psychological and social effects arising from their diagnosis. There is concern that the distress of cancer patients may be under-reported and that services do not always respond to the patients’ psychological needs. 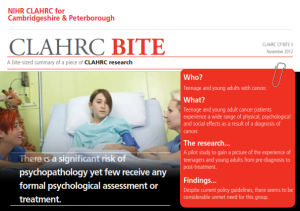 The principal aim of the pilot study was to assess the feasibility of using mixed methodologies in a multicentre study in order to understand the experience of teenage and young adult cancer patients from pre-diagnosis to the post treatment phase; to establish their concerns and priorities and to assess teh extent to which the services were able to identify and meet their needs for psychological help. The study has both quantitative and qualitative components. The qualitative part of the study examines the psychosocial consequences of a diagnosis of cancer, the priorities and concerns of patients and their parents/significant others, as well as the views of oncology staff. The quantitative part of the study uses validated instruments to assess the degree of psychopathology within the patient group. It attempts to establish the ability of the service providers to identify such pathology and respond accordingly. Patients were able to choose between taking part in the full study, involving an interview and completion of questionnaires (SCL90 and RSQ), or the partial study, involving completion of questionnaires only. Parents were invited to complete a questionnaire (York Survey) and to be interviewed if nominated by their son/daughter. The study was a collaboration with oncologists, nursing staff, psychiatrists and young patients at Addenbrookes Hospital.